The new headquarters of the Austrian Automobile, Motorcycle and Touring Club (ÖAMTC) in Wien-Erdberg clearly conveys its guiding principle, “Focus on the person”. Five existing ÖAMTC sites have been consolidated centrally to create an innovative working environment for around 800 employees. The layout of the new ÖAMTC Mobility Centre forms a wheel rim with five ‘spokes’. The architectural highlight of the building is a nearly 17-metre high glass façade connecting all ‘spokes’ of the building and providing protection against traffic noise from the Vienna South East Bypass, like a protective barrier. The Viennese emergency rescue helicopter, Christophorus 9, has found its new home at the very top on the steel heliport. The Unger Steel Group is responsible for the steel construction of the ring façade, for the heliport, the hangar, the platforms, ramps and stairs as well as for the high-rise garage. A total of 1,580 tons of steel were installed, hot-dip galvanised by ZINKPOWER Sinabelkirchen. Intensive coordination was required between the parties involved from the planning phase through to the delivery in order to deliver in batch quantities just-in-time. The Unger Steel Group was awarded the Austrian Steel Construction Prize in 2017 for this project. The innovative use of hot-dip galvanized steel by architects, engineers and steel construction companies is recognised by the “Global Galvanizing Awards”. These awards are presented every three years in conjunction with Intergalva, the international galvanizing conference. 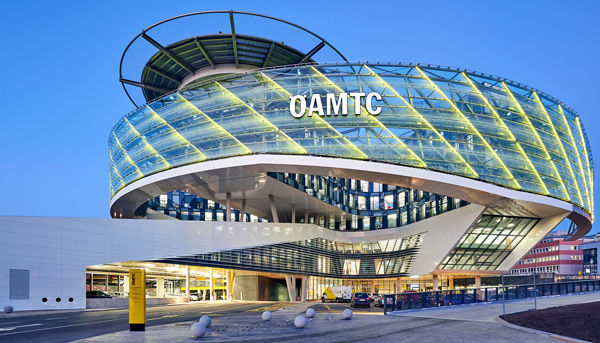 The new headquarters of the Austrian Mobility Club – ÖAMTC for short – is an award winner in the “Shortlisted – Industry Award” category.